WellSpan Sports Medicine staff in Brownstown include (standing, from left) Mary Tierney, M.D. ; Jitesh Umarvadia, M.D. ; and Zachary Geidel, M.D. ; and licensed athletic trainer Jessica Hoenich (seated). WellSpan Sports Medicine has opened in Brownstown, offering the treatment of movement-related injuries from sports, work and daily living. The practice is at 4150 Barrett Blvd., Ephrata, in the Brownstown Commons Building near the intersection of Route 272 and 772. The practice offers a varied array of services for the diagnosis and treatment of movement-related injuries, including imaging, physical therapy, acupuncture, impact testing (computer-based testing for the evaluation of concussions) and PRP (platelet-rich plasma therapy that uses a patient’s own blood cells to promote healing). The physicians at the practice are: Zachary Geidel, M.D. ; Mary Tierney, M.D. ; and Jitesh Umarvadia, M.D. 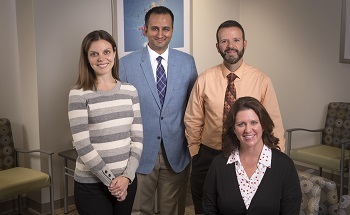 All three physicians at WellSpan Sports Medicine are dually certified in family medicine and sports medicine. The practice also employs a full-time licensed athletic trainer, Jessica Hoenich, a former trainer at Cocalico School District who also has worked with the U.S. Women’s and Men’s National Field Hockey teams and the USA National Bobsled and Skeleton Teams. The practice is open Monday through Friday, from 8 a.m. to 5 p.m. Walk-in appointments are available from 8 a.m. to noon, and scheduled appointments are available from 1 to 5 p.m. To reach the practice, call 717-466-2451. Patients can schedule an appointment online at WellSpan.org.